Saw Mill: These are excellent for cutting small pieces such as lath & may either be left or right handed. Makita 5007MG is perhaps best known for its power, stability, speed and precision, while simultaneously managing to stay in an affordable price range. This saw will satisfy anyone’s needs, no matter what the requirements or how high the expectations may be. It is no exaggeration to say that this is one of the best circular saws in its class. Equipped with an amazing 15-amp, 5800RPM motor, Makita 5007MG delivers enough power to make any seemingly hard and complicated job fun and enjoyable. It can tackle even the most demanding applications such as framing walls, floors, roofs, ripping panels, plunge, bevel and metal cutting with complete ease! 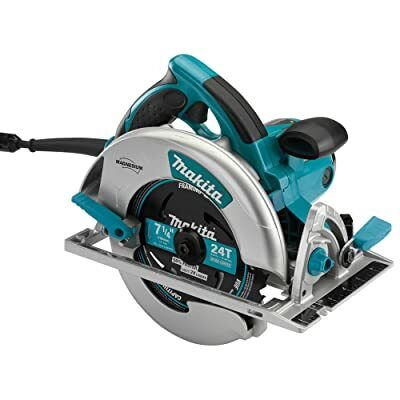 The power is further enhanced by a Makita 7-1/4-Inch Premium Ultra-Coated Framing Blade with an advanced tooth design. This carbide-tipped blade is designed to endure even the most hostile working environment and still come out with clean, precise and long-lasting cuts. Also, an integrated blade-wrench makes blade-changing a breeze! Makita 5007MG has a weight of only 10.6 pounds. It is mind-boggling how something so powerful can weigh so little! The secret, however, is not in the motor – it’s in the light, yet extremely durable magnesium base. This makes the handling so much easier as it increases the comfort, and therefore the very performance of this remarkable saw. Another great feature is the 56 degrees maximum bevel capacity which is perfect for improving visibility and adding additional sense of control. Moreover, the saw has positive stops at 22.5, 45 and 56 degrees. The number markings in a shape of ruler on the base of the saw are very easy to read and enable depth adjustment and precise cut measurement. The handle is quite spacey, so there’s more than enough room for a gloved hand to fit in nicely. It is also ergonomically cushioned for enhancing the comfort even more. Makita 5007MG circular saw has a carefully reinforced cord cable which prevents job-site abuse. Often, these saws are simply taken by their cords and lowered down on the ground, without worrying about the potential damage that can occur. However, with this feature, such problems are almost eliminated and it is much safer to handle the saw by its cord (although not recommended). But that’s not all! – 2 integrated LED lights will provide a rather nice illumination and the ducting is designed to blow the saw-dust away from the user. So, you ask yourself – where’s the catch? Truth is, there is no catch. There are only a few suggestions to be made… One thing that would sure benefit this saw is an electric powered brake which saves time and enables repetitive cutting. However, with an included hex blade wrench, rip fence, tool case and a 1 year warranty with 90 days money-back guarantee – there’s simply nothing to complain about! DeWalt DWS535 is a worm-drive circular saw. How is a worm-drive saw different from a normal circular saw? Well, for starters – its shape transfers a lot more power to its blades and therefore makes it able to cut through hard materials easier than the normal circular saw would. However, speed is often compromised… Worm-drive saws have a significantly slower cutting speed, but this is almost irrelevant compared to the power they add. Light, yet powerful DeWalt DWS535 is perfect for handling and storage. Weighing in around 13.8 pounds, the saw takes a middle class weight. Its 15-amp 4800RPM (no-load speed) motor makes sure cutting is both easy and smooth. Durable magnesium shoe realizes a solid quality cutting platform. DeWalt DWS535 circular saw has a 2-7/16-inch cut depth at 90 degrees and a 1-7/8-inch cut depth at 45 degrees. Its bevel capacity reaches up to class-leading 53 degrees! Also, it has a built-in default bevel detents at 22.5 and 45 degrees (most commonly used angles). It is very well balanced in terms of weigh-to-power ratio and has a nice, ergonomic grip to it, which is very important because it provides the user with comfort. Due to the saws torque, it has a very little lateral twist, unlike some other similar saws. The spindle lock feature makes changing blades a breeze! It also minimizes the downtime and therefore increases the saws efficiency. DeWalt DWS535 has an extra wide saw hook that handles material up to 2-1/2 inches wide. Also, the dual ports in the shoe are made for precise rip cuts up to a 14-1/2 inch capacity. Toughcord retention and protection system is perhaps the most interesting feature of DeWalt circular saws. Because the saws are most often lowered down by their cords, all the jerking eventually compromises the quality of the cord and you soon have to replace it. DeWalt has come up with a Toughcord system that has up to 4x times stronger jerk protection and therefore increases its overall durability. Sold separately, you can also get the rip fence along the saw. This is a great addition because it gives you a long fence to ride against and enables you to cut precisely measured strips. DeWalt DWS535 is a very powerful machine and has all the characteristic of a top quality worm-drive circular saw. With hardly any complaints, this saw is absolutely recommended for any serious carpenter out there. It is also backed by a three-year warranty and a 90-days money back guarantee. You’ve got nothing to lose and everything to gain – give it a try, you’ll be glad you did! DeWalt circular saws have been around for quite some time, and they have never once turned out to be disappointing. 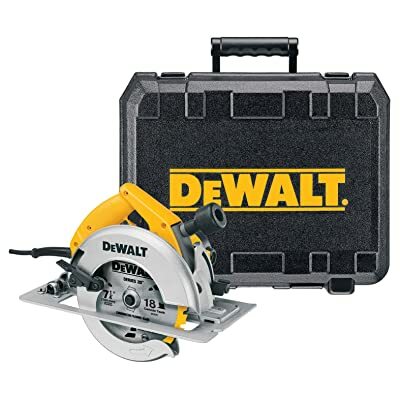 In fact, along with Milwaukee, Makita and Bosch – DeWalt is one of the best brands of circular saws that you can get at this price range. Their famous motto is ‘Toughness Guaranteed’, which should give you a pretty clear picture of how ‘tough’ their products are. DeWalt circular saws are carefully designed with keeping the end-users needs in mind. Their crew actually goes to the job sites, notices what kind of problems people are having, and then takes that as a pattern to build their next products on. 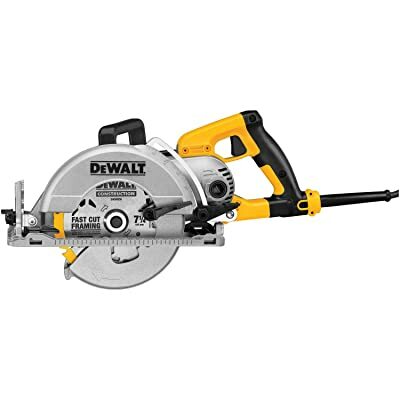 DEWALT DW364K 7-1/4-Inch Circular Saw is one of those products. What are the upsides of DeWalt DW364K? DeWalt DW364K can certainly brag about its 2-3/4 horse power which enables the user to cut wood as easily as a knife cuts through butter. Its heavy gauge, aluminum alloy base takes care of the ‘toughness’ part. A well protected tool with such power can only be messed up by rough and imprecise cuts. However, this is not the case with DEWALT DW364K Circular Saw! This saw introduces a unique feature of rear pivot depth-of-cut adjustment which enables the user to set the required depth without actually removing his hands from the handle! Imagine how much more control you can have and how much time you can save. Not only that, but it also has an electric powered brake which stops the blades in a split of a second, which is great for making repetitive cuts and not to mention the extra safety bonus. DeWalt DW364K weighs 12.3 pounds, which doesn’t make it an absolute light weight champion, but power never comes in small packages. The weight adds that additional balance to it, making it nice and comfortable to handle. Its aluminum alloy base makes sure nothing ever happens to it if it falls down or takes any kind of physical impact. Needless to say, the bevel capacity of an amazing 50 degrees makes the job a whole lot easier because you have a nice clear line of sight and you can always know what’s going on. DeWalt DW364K also has a shaft lock button that is very easy to reach and makes blade-changing a whole lot faster and simpler. What are the downsides of DeWalt DW364K? One of the first things that most people are uncomfortable with is its weight. Compared to other models, this circular saw could certainly weigh a little less. Strangely, this same feature makes others excited because apparently it provides the user with a sense of high power. Also, like with any other circular saw, the included blades could be a bit sharper and many recommend buying a separate set of blades in addition to the saw. There’s one thing that can be claimed with absolute certainty – this saw will not let you down. It has all the power, stability, balance and durability you need. It also comes with an included warranty so you can set your mind at ease when purchasing. 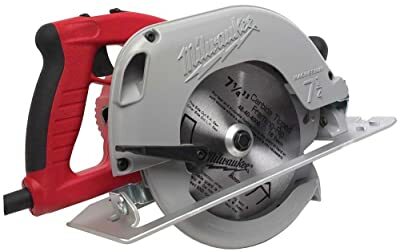 Milwaukee 6390-21 7-1/4-Inch 15-Amp Tilt-Lok Circular Saw is perhaps one of the best circular saws currently on the market. For such a price, this beauty is a bargain! What are my reasons for such a claim? Keep reading to find out. Have you ever found yourself in a situation where you need a tough work done fast, but your saw just isn’t fit to do the job? Let me tell you, you’re not alone… We’ve all been there. But imagine instead your old saw, you were holding a brand new Milwaukee 6390-21! You could just feel the 3.25 horsepower motor cutting through any rough material with extreme ease and comfort. There’s no task big enough for this little 15amp powered beast. Moreover, you won’t just save your energy, you will save time as well. Milwaukee 6390-21 cuts through anything with unbelievable speed while maintaining staggering precision! This great feature completely eliminates the time-or-quality factor, allowing you to enjoy both at the same time! What exactly makes Milwaukee 6390-21 so easy to work with? One of the reasons is surely its unique user-friendly design. Weighing only 10.4 pounds (the lightest-weight saw in its class), the 6390-21 has a ‘Tilk-lok’ component which enables you to assume any working position you prefer, while automatically adjusting itself to the requirements. This means you no longer have to do a stunt to pull off a simple cutting task. Another great feature is its blade bevel capacity which easily reaches 50 degrees and provides you with a clear line of sight, keeping you in total control all of the time. This ensures not only accuracy and precision, but safety as well. Furthermore, the handle can be cushioned in eight different ways. All these remarkable characteristics make Milwaukee 6390-21 circular saw stand out from other circular saws, particularly its unique ability to adjust to the user needs. Changing blades is as easy as changing babies diapers (just not as messy)! Thanks to the one-touch spindle lock, it can literally be done within seconds. Safety is not a problem either – a solid base plate and an excellent blade guard will make sure nothing ever happens to you, or your saw. Bevel and depth settings are also easy adjustable, thus once again making sure you end up with a precise cut each and every time! OK, so you might already be asking yourselves – where’s the catch?! Well, there’s but a few negative points to Milwaukee 6390-21. One of them is a slightly oversized casing, which is responsible for taking up too much space once stored. Also, the blades are located on the right side of the saw, making it a little harder for the left handed individuals to operate. However, these minor drawbacks cannot possibly measure against the power and flexibility of this machine. Milwaukee 6390-21 comes with a 5 year warranty, making sure that by purchasing – you have nothing to lose and everything to gain! Milwaukee 6394-21 is certainly amongst the champions of circular saws! Let us closely examine its advantages and weaknesses in order to evaluate its worth. 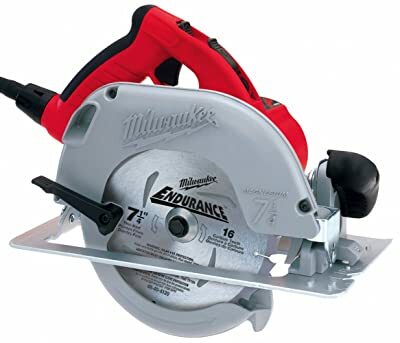 What are the advantages of Milwaukee 6394-21? Made with a carefully designed Tilt-Lok primary handle, the Milwaukee 6394-21 is constructed to provide the user with an extreme comfort, while at the same time making sure the cuts are always accurate and precise. The handles are economically cushioned and the primary handle position can be easily adjusted to best fit your grip. One of the most amazing features of Milwaukee 6394-21 is its ability to stop the blades within seconds, using the power assisted brakes. This feature not only enhances repetitive cutting, but improves the overall safety of the saw. It also makes the ON/OFF status switching almost automatic! Weighing only 10.4 pounds, the 15 amp powered Milwaukee 6394-21 is able to produce outstanding power of an amazing 3.0 horsepower (5800RPM)! It is almost hard to grasp how something so light can produce such power. This is the reason why it holds the title of best weight-to-power ratio circular saw in its class! However, power without precision means nothing. That’s why the 6394-21 pays special attention to accuracy and comfort. The more comfort the saw offers, the more accurate cuts we can make. This, combined with the incredible power, is what makes Milwaukee circular saws really stand out. Thanks to the QUIK-LOK cord system and the positive lock feature (an integrated button on the saw), the Milwaukee 6394 makes cord swapping a child’s play. QUIK-LOK system also enables the user to swiftly replace the cords on the jobsite, thereby reducing the downtime period to minimum. The saw is also equipped with an aircraft aluminum shoe which is carefully designed with an intention of preventing any kind of bending. Depending on your requirements, you can easily adjust both depth and bevel of the cut. The bevels can be adjusted up to 50 degrees, providing you with a clear line of sight and a strong sense of control. What are some of the downsides of Milwaukee 6394-21? Just like every other product, this saw has its minor drawbacks. Some people that purchased Milwaukee 6394-21 reported that the blades that come included with the package are not quite as good as they could be. This, however, is not related to the quality and performance of the tool itself, as blades can easily be changed and replaced for new ones. Moreover, left-handed individuals may not find the saw too comfortable because it blows the sawdust in their way. If this bothers you, you should probably choose another model. 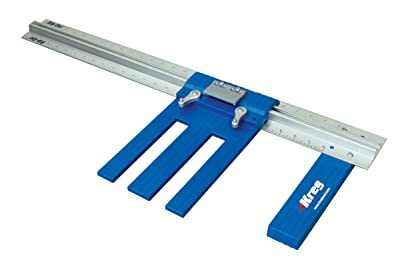 If we take all the advantages and put them on one side of the scale, and put the disadvantages on the other side, it is pretty clear that this saw is definitely worth your money. To clear your doubts even more, it comes with a 5-year rock-solid warranty. The circular saw requires a little introduction. Technically a circular saw is a tool designed for rapid and accurate cutting of sheet materials and timber with a flat surface. It uses a circular blade to do the actual cutting, and features a number of design elements to keep the operator safe and to make the tool easy to handle and use. If you have been using the circular saw for your weekend woodworking projects, still you need to understand the working of a circular saw. Proper use of the circular saw not only guarantees precision results but also keeps the operator safe from any hazards. Here are few tips on how to use a circular saw. Using a circular saw starts with equipping yourself with proper safety gear. An eye-protector or eye-cover is a must while working with the circular saw. Make sure you are using a correct blade which is properly sharpened. Dull blades should be avoided as they bind and overheat. Set the depth of the blade to no more than 1/4 inch more than the thickness of the wood to be cut. The work piece is more likely to kick back if you have too much blade exposed. Never force the blade into the material to be cut, instead apply gentle pressure. Firmly holding the grip or handle, running the motor at full RPM you can begin to cut. Support the work on both sides. Clamp it on one side if you have to. At the end of the cut you will no longer have the material supporting the saw’s weight so be ready for this. Wait for the blade to stop completely before you remove it from the material. If you have been using the for your simple woodworking projects you will understand that cutting through straight lines with the circular saw can prove to be challenging. Such jobs can be simplified by the help of a circular saw cutting guide. A cutting guide enables you to cut through straight lines with a lot much ease and flexibility. And there’s no need to get a cutting guide from the hardware store. This simple guide can be made with the tools available in your toolbox with absolute ease. Your own circular saw cutting guide is simple to make and requires the following tools and process. Cut the 1/4″ plywood to the exact length of the fence. Attach the fence perpendicular to the bottom of the 1/4″ plywood, using a and screws. If the screws protrude, file or sand them down to protect your hands. Screw or clamp the finished guide in place before using it. If you feel you don’t have enough time to build your own circular saw cutting saw guide you can order it from a lot of suppliers. At the end of the day you will find out that the circular saw cutting guide saves you a lot of time and brings precision into your work. While working with a circular saw, it is especially important to wear eye protection. To safely use a circular saw, the first step is to select the blade appropriate to the job, firmly attach it to the saw using the arbor nut, then adjust the sole plate for proper height and bevel for the job. When ready to cut, plug the saw into an electrical outlet, firmly hold the handle, align the blade near the mark to be cut, press the safety switch, then press the trigger switch. Slowly follow the cut mark. When nearly done, make sure the end of the wood being cut is held and will not splinter due to the unsupported weight. For safety, remember that the teeth are sharp and should not be placed on surfaces that they could damage. The most important characteristic for the circular saw blade is its sharpness. A dull blade can lead to unsafe conditions. For the casual carpenter, it may be just as inexpensive for you to buy a new blade as it is to sharpen the one you have. Always keep the angle between the base of the saw and the saw blade at perpendicular–90 degrees. Usually, the circular saw comes with this angle preset; however, use and movement may cause this angle to adjust. If you do not use your circular saw very often, then you must store it in its case. This would help to keep the excess moisture from getting into the metal and causing rust decay. These steps will help keep your blade in top-notch condition. The applications and/or materials to use for the project. Period of time it will be used. Would it be in a short period or long continued use like a whole day’s work? Preference to corded over cordless tools or vise versa, depending on what is convenient. The two main designs of a circular saw are the worm drive and the sidewinder. It is also classified according to power source, the corded and the cordless circular saws. Knowing these will surely help the buyer discern what saw to purchase. Worm-Drive Circular Saw is a cutting tool best for plywood and studs. It can also operate in a whole day, thus, making this a conventional favorite by professional carpenters. The motor is parallel to its blade that delivers enough torque and it is best in cutting wet lumber and concrete material. As it is heavy duty, it is also heavy weight. The less popular hypoid-gear saw is also powerful, with excellent performance and stylish design like a worm-drive saw. Sidewinder Circular Saw. This is the most common saw used in most construction areas and also at home. It is also referred to as the in-line saw or the traditional saw. Its motor is positioned perpendicular to its blade making it more stable but it lessens it power. The saw with helical gears delivers that heavy cutting job without necessarily being heavy. Cordless saw provides portability and easy movement around the working area, also eliminating the burden to carry massive extension cords or generators. But power is also less in this type of saw. This attribute is sacrificed by being convenient and unlimited working period offered by corded saws. Also, this type of saw usually has smaller blade diameter compared to most corded saw which has 7-1/4 inches. On the other hand, Trim saw is a circular saw with a predominantly smaller blade diameter of mostly 3-1/2 inches to 4-1/2 inches. It is intended for finishing works that involves thin materials. Accessories are a necessity when a perfect straight cut is required to be produced with a circular saw. Even the most experienced users fail to produce a flawless cut without the right accessories. Accessories such as hangars, rip fences, clamps and rails make using a circular saw an effortless task. Mentioned below are the best five accessories that will make your circular saw usage experience a smooth one. Rip fences are fastened to the circular saws for precise and smooth results. Every brand of circular saw has its very own rip fence. 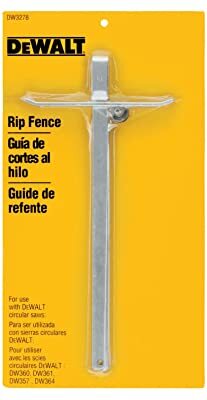 Certain rip fences are compatible with the circular saws of other brands. The rip fence is very simple to fasten and functions by designating the distance from the blade to the fence. Attaching the rip fence to the saw is easy. It is done by inserting the rip fence through the slots at the front of the shoe and by tightening the screw. The rip fence is a piece of rugged craftsmanship and is produced from metal. If the edge is straight to begin with, the rip fence is a very good option to clamping a fence down to work. The fence that is put together is for hanging outdoors and the rip fence is essential in making accurate cuts. 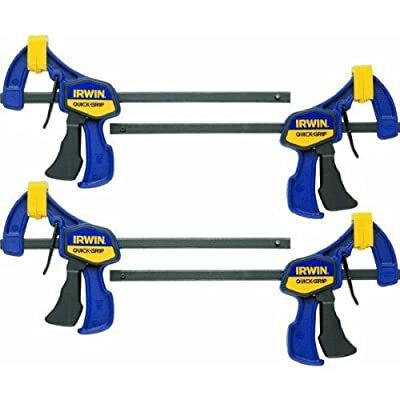 Clamps are generally used as guides with circular saws and routers. Efficient and versatile, the clamp allows you to make precise and clean cuts without causing side shifts. Clamps come with a T-track, increasing their functionality to be used with a variety of tools. Clamps are a highly capable addition to your tool set. They can be paired with standard home-made shop jigs and can be used with table saws, drill passes, routers and circular saws. They ensure that you can tackle jobs requiring router guide plates and stop blocks. They can be clamped across the width of the board to provide a strong, firm straight edge to guide a circular saw. The setup is very quick, intuitive and saves a lot of time. Ripping the large panels into smaller ones is a tricky task. Ripping large wooden panels into smaller ones is an intimidating job as it requires a great deal of balance and concentration. Even if you are ripping with the best table saw, you still need to lift heavy wooden panels, balance them properly to avoid bending while simultaneously trying to collect and adjust the finished work pieces as they exit the saw. The rip-cuts are extremely versatile and are handy tools which speed up the process of ripping down larger panels into smaller ones. No markings and chalk-lines are required. Rip-cuts attach easily to circular saws and allow you to gain tremendous accuracy. 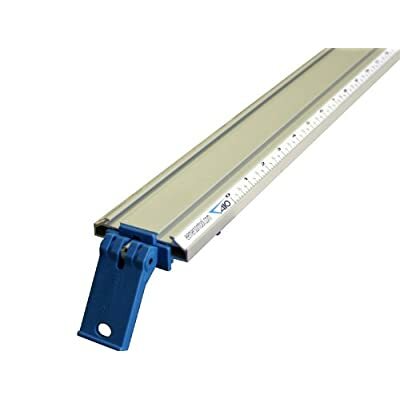 Rip-cuts feature durable designs including aluminum rails and easy-to-read adjustable scale. Clamping edges with their extruded aluminum body ensure rigid clamping and straight accurate cuts. A large handle creates high clamping pressure when making angled or straight cuts. The soft-grip clamping foot ensures the material is held firmly in place, without causing damage to the work. Clamps can be used for other types of tasks too, such as gluing. This circular saw accessory increases the efficiency of circular saws, routers and other tools. The brakes help in stopping the blade after the trigger is released. Made up of durable design, the brakes help in smooth retraction. Wrench storage allows convenience for blade changes and easy storage. A carrying case is usually provided for easy portability. Ensure to add these amazing and efficient accessories to get perfect and accurate cuts from your circular saw and save a lot of effort and time.